Stimulating, clearing and antiseptic. 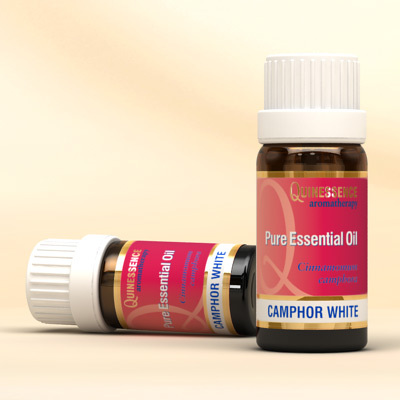 Obtained from the chipped wood, root stumps and branches of the camphor tree which is native to China, Japan and Taiwan, camphor essential oil has been used for medicinal purposes and as an insect repellent for centuries. Most people are familiar with the distinctive smell of camphor essential oil which can also be effectively used to kill air-borne bacteria. Camphor oil has the ability to feel both hot and cold (like peppermint oil) in use making it valuable for general muscular aches and pains where it initially cools, and then warms, soothes and eases aching muscles. For best results use this oil in massage after a strenuous day. Inhaled from a tissue or vaporized, camphor essential oil is an excellent decongestant that brings relief to blocked sinuses and clears a chesty cough. Camphor’s stimulating properties activate sluggish circulatory and digestive systems as well as clearing and sharpening the mind.